Employer branding firm Toronto Archives - Powerhouse Talent Inc.
We have the ability to create systems that include the best of human experience and AI capabilities. We can use the efficiency of AI and machine learning to give our recruiters the bandwidth they need to turn candidates into hires. Ready to learn more? Check out our employer branding and talent attraction courses and coaching programs here. Recent college graduates are more attracted to jobs in the arts, media and social services than graduates were four years ago, according to an Indeed report. Indeed’s findings show job seekers just out of college are less drawn to jobs in business and finance, including roles as economists, actuaries and statisticians. You’ve heard it all before. There is a war for talent and it’s not getting any easier to fill those critical roles that are fundamental to your organization’s success. If you are like most SMBs, you may be asking yourself how you can compete with the big guys. Come hither friends because we have put together seven steps to help small business attract big talent! 1.Own who you are – This is not a time for “fake it till you make it”. You have a unique value proposition and it’s time to discover who you are as an employer and share that uniqueness with the world. Before commencing a recruitment journey, self-reflection is a great starting point. You may wish to formalize this self-reflection and analysis in the form of an Employee Value Proposition (EVP). To learn more EVPs, click here. Regardless of how deep you wish to go with the process, you can’t attract others to your mission if you don’t know who you are first. 2.Design an end to end recruitment process – Now that you’ve uncovered your “secret sauce”, it’s time to build a candidate journey that delivers a remarkable candidate experience while optimizing the journey for efficiency. Time kills deals! This is as true in recruitment as it is in sales. This is not about how quickly you can hire a body. This is about process excellence and allowing quality candidates to effectively navigate the journey with ease. Not a DIYer? 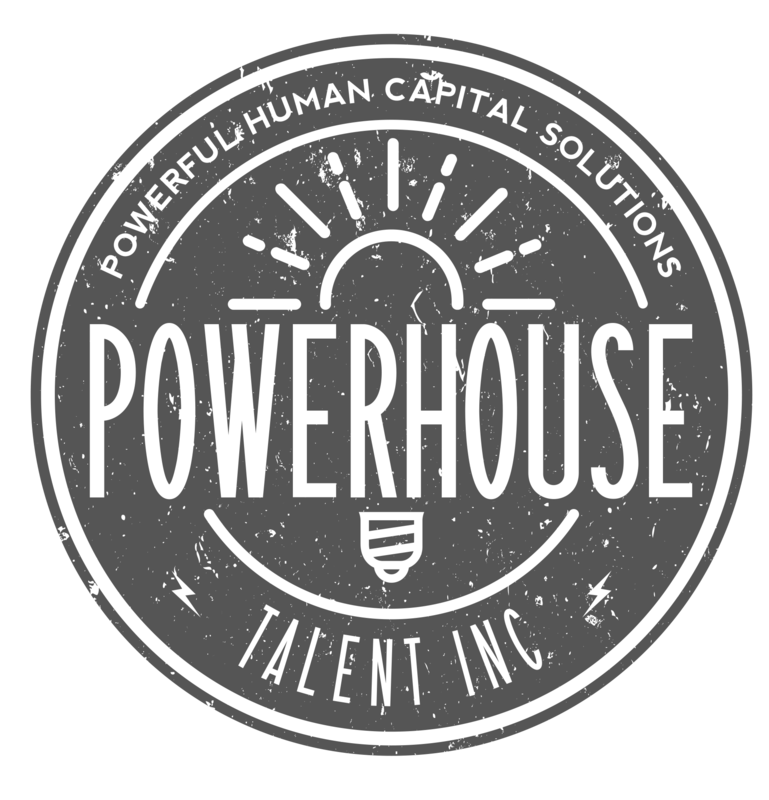 No worries, check out our recruiter training and blueprint…The Powerhouse Process. Still got the DIYer bug? We love that! Keep reading. 3.Train your hiring leaders– Your hiring leaders will shape the journey so we best be skilling them up to deliver a first rate experience. Train your hiring leaders on the overall process, what to ask in the interview and what not to ask. Help them see the bigger talent brand picture. Knowledge is power so enrich their skill-set with tools and education to help them rock the recruitment process. 4.Clearly define your needs upfront– Now that you have the process down, it’s time to consider the needs of the current vacancy. Many hiring leaders fail to spend the time to consider the true business need, not a wish list or a generic list of skills. What are the REAL requirements based on the actual accountabilities for the role? What skill-set would one need to have in order to perform the role? Next, articulate those needs in a manner that highlights your EVP or the “why” around your organization. 5.Select the right channels for advertising – Consider your ideal candidate and ask yourself where might they be spending their time. Select ideal channels and monitor your progress. If a channel is not producing the ideal results, optimize the posting further or select a new channel. Regular monitoring will allow for process speed and ease. Better yet, consider programmatic job advertising where you only pay per applicant and roles are distributed across numerous channels. We’ve partner with a leader in programmatic advertising and can support you through this process. Hit us up here. 6.Add personal touches along the way – Once your have shortlisted candidates and have started the journey, make it special! This is where a SMB can shine!!! Many large organizations lose prospective talent by being plagued with impersonal and generic candidate experiences. The interview process is a time for authentic relationship building, not a tick box exercise. Block multiple interviews into one day to help candidates have an easier time attending. Switch up the interview venues throughout the day by moving from meeting room to employee lounge to local coffee shop. Help candidates envision themselves working there, walking the neighbourhood, feeling out the employee experience. This alone is game changing! 7.Close out the process with a killer onboarding process– Knock it out of the park with an outstanding onboarding process. This doesn’t need to mean endless curriculum building. This is all about helping talent build a strong internal network quickly, communicating the excitement of their arrival to the team in advance, and planning for a special first week. Double down on people related activities and have a simple checklist to get the routine tasks organized such as technology ordering. Well there you have it! As an SMB, you have a unique opportunity to humanize the recruitment process like no other. It all comes down to strategy, process excellence, and hiring leader development. Ready to learn more? Check out our courses and coaching programs here. With the unemployment rate at the historically low level of 4%, the war for the top talent rages on. Attempting to attract the best people, many companies offer top quartile pay, expansive benefit plans, fun office spaces and creative perks. Competing for the best talent with companies like Google and Facebook is very hard and very expensive. Need help with your employer branding efforts? Give us a shout! Our Employer Branding Fast Pass program is easy on your team’s capacity and your budget! One company that has come a long way, and can show us all how to make change-in a short amount of time-is Redfin, a real estate technology company based in Seattle. When Bridget Frey joined the team in 2011, she was one of just a handful of female engineers. To learn more about Redfin, check out their website here. Need help attracting talent to your organization? We have employer branding solutions for companies for all sizes and budgets. Hit us up here. Join our journey on instagram. Leonardo da Vinci wrote the first CV in the 15th century when he applied for a job to the Duke of Milan. There hasn’t been much change in the recruitment industry in the intervening 500-plus years. Need help getting started with employer branding? Check out our FREE Getting Started With Employer Branding Guide. Click here and don’t get left behind! Two years ago, a long-standing neighbourhood second tier coffee shop chain was replaced with a Starbucks. The former coffee shop was usually empty. While they made awesome donuts, they struggled. Down came the sign and nobody knew what would soon occupy this prime corner lot. Then came the infamous green signage, the modern refacing of the exterior, and beautiful interior fixtures that felt like home (or at least a home we wish we lived in). There was no modification to the physical structure, in fact the floor plan remained unchanged. Today this Starbucks is constantly packed. From students to entrepreneurs, from parents to neighbourhood kids, it’s the local go to place. Why is it now so busy? They both served coffee, had ample seating, and played music. One magnetized customers while the other was unnoticeable. Starbucks created an experience in the truest sense of the word. When the HR community talks about “employee experience”, many redirect the discussion towards process optimization which may be part of the solution, but not to be confused with the immersion of partaking in a meaningful moment. So what can we learn from this java transformation? Create an energy – It all boils down to energy. As Marty Neumeier says, brand is a “gut feeling” about a product or a service. Starbucks created an energy around who they are, what they stand for, and what one can expect. There, we are introduced to vibrant music some of which we have never heard before, versus the typical elevator soft rock pouring through the speakers elsewhere. Staff are laughing and chatting with each other as well as customers. The lighting is dim and warm in stark contrast to the sterile and impersonal environments elsewhere. Ask yourself – What is the energy of your workplace when you enter the door? Even schools these days are pumping music through the PA system to kick off the day with the “right vibe”. Vanilla (unless as an espresso shot) is the equivalent of white noise – Starbucks didn’t play it safe, they played it as them. From their decor to their music selection, it’s not for everyone but when it’s right, it’s VERY right. This is how you create raving fans. Apple also takes bold stances and as a result, their following is deep-rooted. Playing it safe and opting for vanilla will never create a remarkable brand. Ask yourself – What is your organization’s brand personality? If you are struggling to find an answer, there’s your answer. Ditch the vanilla and leave your mark. Traditions matter – Cultivating an experience is about creating customs and traditions. Starbucks writes your name on a cup and we joke at some of the strange spellings, but we have come to expect that as part of the experience. It is personal. It is distinct. Ask yourself – What traditions do you share as a company that are embedded in who you are and are part of the fabric of your culture? What playful and memorable moments occur during important milestones (onboarding, birthdays, baby showers, etc.)? Create belonging – Starbucks creates warmth and comfort at every turn. They use woods instead of plastics for seating, as though they are inviting you to “stay awhile”. This again is in stark contrast to the turnstile “fast food” ambiance that we have come to expect elsewhere. Companies too should be looking to foster belonging and warmth. From the outset, organizations that create a comfortable environment for talent to explore opportunities within, will be the ones that win, over those that “grill” and intimidate during the interview process. Ask yourself – Are you creating comfort and belonging in your interview process? The power of brand – Brands are built on consistency. Starbucks has found their “secret sauce” for creating a welcoming environment that has personality and emits an energy drawing in both new and repeat customers. Instead of building a process, build an “experience”, master it, and then create a system for consistently delivering it. Your employer brand will thank you. While this example may appear to paint a picture of a diehard Starbucks coffee drinker, in fact nothing could be further from the truth. While I will drink Starbucks coffee during my many visits there, it is not my preference. So why do I keep going back? I return to truly experience something more than a transaction. Your current and prospective employees seek the same. Need Employer Branding help but worried you don’t have the budget? Check out the Employer Branding Co-Operative for EB coaching. Let’s hit it out of the park together! Full-service more your style? Hit us up here. The “war on talent” is mostly due to a shortage of skilled labour. How can the Employee Value Proposition help employers attract and retain talent, especially in the world of international assignments and global mobility? This article is taken from the latest issue of Relocate magazine. Need a hand crafting your EVP? Hit us up! Give us a shout to learn more about how we are making employer branding feel easy! Click here to learn about the Employer Branding Co-Operative. The Talent Attraction Game Has Changed! By requesting this FREE guide, you agree to receive periodic email news and insights from Powerhouse Talent. You can unsubscribe at any time...no hard feelings.